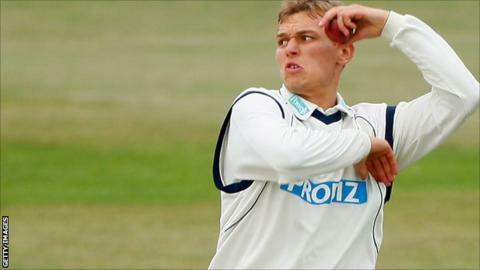 Hampshire have replaced Danny Briggs with David Balcombe for October's Champions League pre-qualifying tournament in South Africa. Hants qualified for the tournament for the first time after winning the English T20 competition in August. Left-arm spinner Briggs, 21, is getting married and will also be on honeymoon during the tournament. He has already had to postpone his wedding once following his inclusion in England's ICC World Twenty20 squad. New Zealand side Auckland Aces and Pakistan outfit Sialkot Stallions will be in Hampshire's pre-qualifying group in South Africa are, with the winners going through to the Champions League proper. Balcombe's 59 County Championship scalps made him Hampshire's leading wicket-taker in all cricket this summer, but it is six years since he played his only Twenty20 game for the county. Hampshire squad: Shahid Afridi, Jimmy Adams, Kabir Ali, Sean Ervine, Liam Dawson, James Vince, Michael Carberry, Michael Bates (wk), Dimitri Mascarenhas (capt), David Griffiths, David Balcombe, Chris Wood, Glenn Maxwell, Hamza Riazuddin, Bilal Shafayat.